Maybe someone in your house hold is allergic to dust, pollen or pet dander. Maybe you're concerned about pollution from the VOCs in your furniture and household products. Or you might be dealing with cigarette smoke or smoke from a wood stove. Whatever the reason, you want to choose an air purifier that's going to work the best for your situation. That's why you should consider an Alen BreatheSmart. Unlike other air purifiers, it has four different HEPA filter options to address your specific air quality issues. And it has a lot of other great features going for it. What are the filter options? How do the controls work? Is it noisy? How much does it cost? This review will answer these questions and more to help you decide if this is the right air purifier for you. You can skip to a specific question in the Table of Contents below, or scroll down to read the entire review. In a hurry and just want to know the price? You can find the current price and availability at Amazon by clicking here. What are the main features of the Alen BreatheSmart? Is the filter a true HEPA? Is it easy to change the filters? How much do the replacement filters cost? Does it work as a dehumidifier? What size room does it cover? How big is the Alen BreatheSmart? Is there a BreatheSmart for smaller rooms? Does the Alen BreatheSmart come with a warranty? Where can I get a good price on an Alen Breathesmart? What really stands out about the BreatheSmart is that it's customizable. You can choose the type of filter you need for your current needs, and if your needs change, you can switch to a different type. You can also choose between 14 different front panel colors to blend in with your décor. The automatic SmartSensor detects particles in the air and adjusts the speed of the filter accordingly. That means that it won't use any more energy than it has to and the filter will last longer, too. A Filter Life Timer tells you when it's time to change your filter. No guesswork! It uses what they call WhisperMax Technology - a fan designed to move a large volume of air at a minimal noise level. An ozone-safe Ionizer makes particles stick together, making it easier for the purifier to catch them. This improves the overall performance of the filter. You can turn it off and on at control panel. It has 4 fan speeds, and it also has a timer that you can set for 4, 8 or 12 hours. So you can choose exactly when and how much you want it to run. Or, if you prefer, you can just set it to auto and not give it another thought. The BreatheSmart has an easy to read digital display and easy to use control buttons. Safety features include auto-off when the front cover is removed and a child-safe vent guard to keep little fingers out. Colored lights on the control panel tell you the level of pollutants in the air and at what speed the BreatheSmart is working. You can turn the lights off at night so they don't keep you awake. 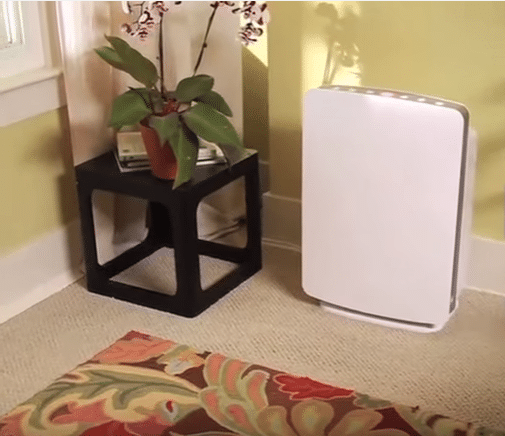 HEPA-Pure is the standard filter for everyday removal of dust, pollen, and pet dander. HEPA-FreshPlus also removes smoke, VOCs and other chemicals. It's a great choice if you're doing home renovations. HEPA-Silver has activated charcoal for light odors and an antimicrobial layer to remove mold spores, dust mites, and bacteria. This one is good for asthma sufferers. HEPA-OdorCell neutralizes odors from cigarette smoke, pets, and diaper pails. If cigarette smoke is your main concern, you should choose this one. A true HEPA filter does remove more particles than a HEPA type filter, but not much more - 99.99% compared to 99%. But a true HEPA also restricts airflow, so it needs a more powerful motor to move the air. A more powerful motor means a noisier machine. The trade-off is a less than 1% difference in particle removal for a quieter machine. Alen filters provide high level filtration and circulation while maintaining an acceptable noise level. Yes. You just take off the front cover, pull out the old filter, and insert the new one. That depends on factors like the speed that you set it at. If you run it constantly or if your air quality is pretty bad, you'll need to replace it every 6-12 months. It can last for 12-18 months if you only run it when you need it. The price varies, depending on the type of filter. You can save quite a bit by buying a multi-pack. Click here to check the current prices and availability at Amazon. It's quiet on the low and medium settings, so it's good for sleeping. High and turbo speeds are a little loud. You can turn it on the highest setting or on auto for an hour before going to bed. Then when you go to bed, turn it down to low or medium. Also, if you set it on auto, it automatically adjusts the speed according to the amount of particles in the air. So at night, when no one is moving around and stirring up the allergens, it will turn itself down to low and you will barely notice it. Some people say it interferes with tv watching when it's running on high, and they have to turn up the volume on the tv. That may or may not be an issue for you. Yes. Alen air purifiers do not emit ozone. They are certified ozone-free by the California Air Resources Board (CARB). No, it does not remove moisture. It only cleans and purifies the air. It's best for rooms up to 1100 square feet. It measures 26.75 inches x 10 inches x 17.75 inches and weighs 21 pounds. It's kind of big, but it has a handle to make it easier to move. Yes. The Alen BreatheSmart is Energy Star Certified (105 watts on highest speed). Yes. The Alen BreatheSmart FIT50 has all the same features but it's designed for rooms up to 800 square feet. It measures 22.25" x 16.75" x 10" and weighs 16 pounds. It's also Energy Star Certified (60 watts on highest speed) and the front panel comes in 13 different colors. Yes. It comes with a lifetime limited warranty and a 60-day money back guarantee. I found the Breathesmart for sale at several online retailers. If you're going to buy it online, you'll want to buy it from a trusted source. Amazon is always a good choice because they protect your personal information and they honor their return policy. And if you're an Amazon Prime member, you'll get free shipping on qualified purchases. Because the prices at Amazon can change without notice, I don't include the price in my reviews. But you can easily check the current price of the Alen BreatheSmart by clicking here. If you want to check the current price of the Alen BreatheSmart FIT50, at Amazon﻿ click here. If you need an air purifier, I really don't think you can go wrong with the BreatheSmart. I like that you can match the filter type to your individual situation and customize the front panel to match your décor. I also like the user friendly control panel that lets you choose the speed settings and set a timer if you want. The ability to set it on auto and let the sensor adjust the speed is great, too. Most online customer reviews I've read agree that it does an excellent job of removing odors, dust, dander, and pollen. It also picks up a lot of pet hair. Asthma sufferers report that they can breathe more easily and don't have to use emergency inhalers as often. It's powerful enough to purify the air in a large area, but it's quiet and won't interfere with your sleep. That's a big plus! Purchasing a BreatheSmart is an investment in your family's health. It is on the expensive side, but like anything else, you get what you pay for. It's powerful and effective and does what it's supposed to do. And with a 60-day money back guarantee and lifetime warranty, there really is no risk. If you think the Alen BreatheSmart or the BreathSmart FIT50 is for you, click here to check the current price and availability at Amazon. If you're not sure this is the right one for you, and you'd like to check out some other great options, please see Best HEPA Air Purifiers for Home and Office.